For years Baltimore has lacked a consolidated rail system map. Rather, they had separate maps for the Metro-Subway, light rail, and MARC, even though all are run by the same agency. This made navigating the city’s rail system unnecessarily difficult, since users hoping to transfer between the various rail modes had to consult multiple maps. Finally, late in 2011, a consolidated rail map for Baltimore was published. It’s not the world’s greatest example of graphic design, actually it’s quite awful from that perspective, but at least it’s functional. It is easily the most fully integrated rail system map I’ve ever seen for the city. 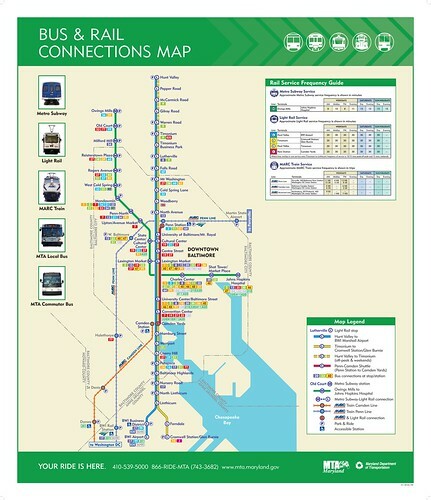 The map is one part of an entire series of new transit maps produced by MTA for the Baltimore region. There are several interesting maps in the series, including a diagrammatic bus system map (as opposed to a geographical one), and a WMATA map showing MTA bus connections.